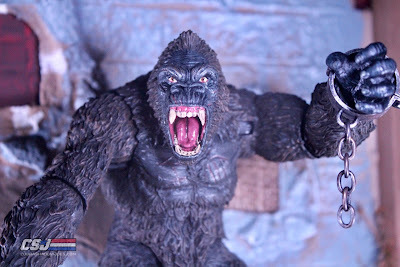 King Kong is a classic character that I've never liked in any figure format...that is until I received my Mezco Toyz version. Kong should be a large beast with some girth to him and maybe a few battle damage and scars, and that is exactly what Mezco delivers. Let's take a closer look at the ruler of Skull Island and all the things he has to offer to you as a collector. As many of you know by now I love Wolverine as he is my favorite superhero. There can never be too many Wolverine figures for me. I was pleasantly surprised when Mezco announced that they would be making a 5 Ronin version of Wolverine. I bet you never knew you needed a Wolverine with a man bun! The 5 Ronin Wolverine is based on Marvel's 2011 five issue series. Each issue focuses on a different character (Wolverine, Hulk, the Punisher, Psylocke, and Deadpool) and takes place during 17th century feudal Japan. Iron Man has so many different suits it's hard to keep track of which ones are from which comic or movie. Mezco's first Iron Man release is the 42 with black, grey and gold highlights with a majority of them being on the metal body. 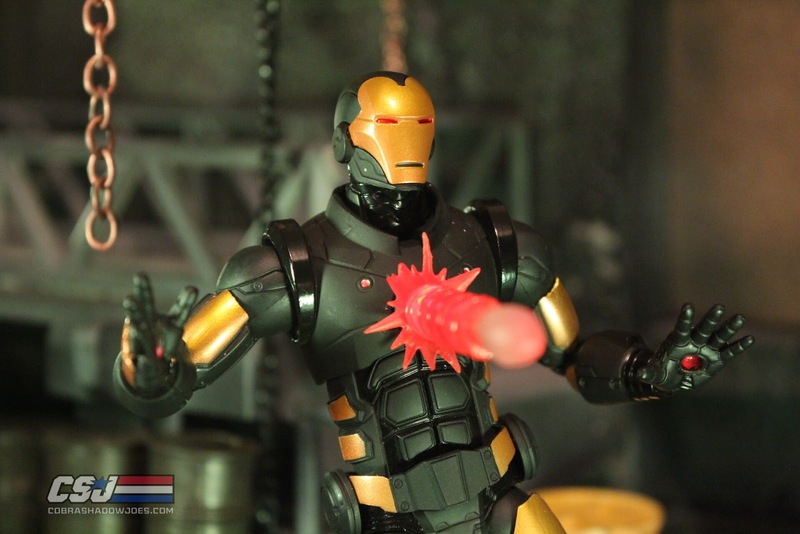 Iron Man's suits all have a certain lure to them, and the black and gold on this one looks really sharp. We will be getting more suits out of Iron Man's army, but let's take a closer look at the Model 42. She likes to lick her paws and scratch your eyes out! Catwoman is a staple character for DC Comics and big within the world of Joker and Batman, but she is not one of my favorite characters. Mezco Toyz continues to expand their One:12 line by releasing their third female character so far. 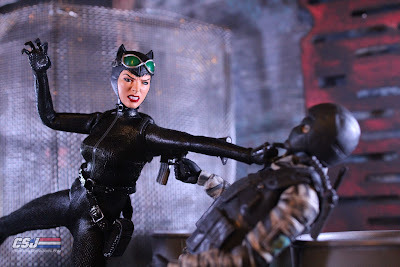 Like Harley Quinn, Catwoman has some really cool things about her, but she also has some subtle flaws to deal with. It's time to take a closer look at what Mezco has produced with their first release of Catwoman. GODZILLA!!!! Even though King Kong is my ultimate favorite monster how can you not like Godzilla?!? (Godzilla is Steve's favorite though...he has a thing for reptiles). This is an awesome looking iteration of Godzilla from the 2016 Shin Godzilla film. I was particularly hyped about this figure because of how awesome the purple looked on him! Well, let's see how well that dope glowing purple look translated once it was put into action figure form. 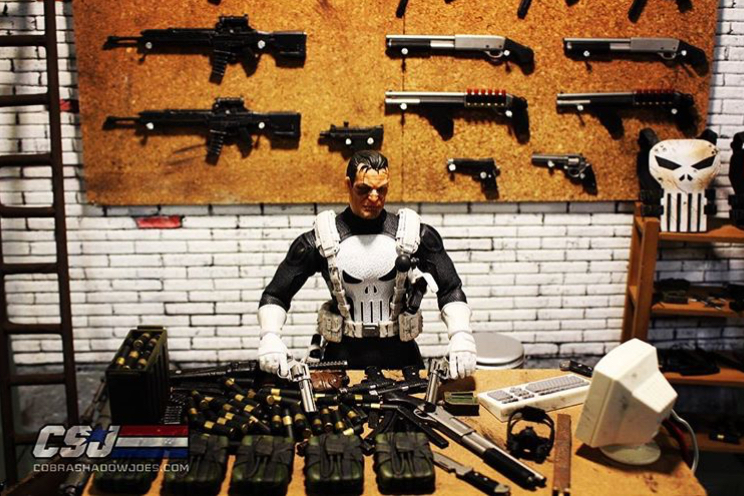 The Punisher's look has evolved over the years, but he was originally introduced in a slick dark blue uniform with white accents. Spiderman was the first comic he showed up in, but he quickly grew in popularity and evolved into a super hero (or maybe antihero is a better term) character for Marvel. I actually think the clean tight fitting suit in dark blue with white accents is an awesome look. While no company has compiled this look with fabric Drone Customs decided he needed to provide it to the masses! 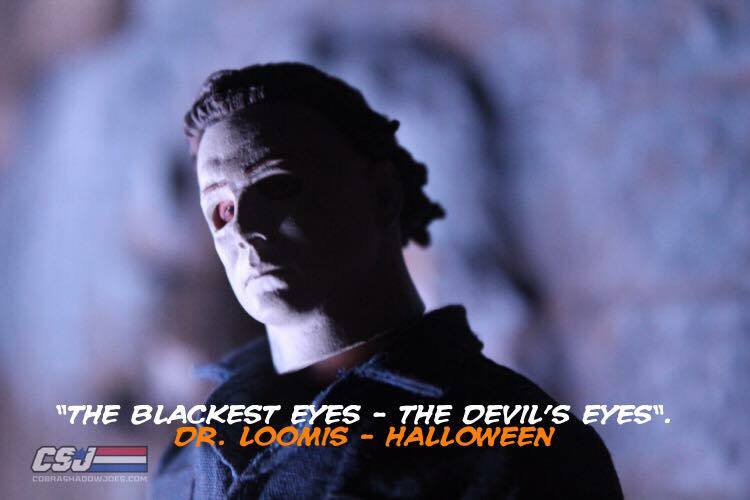 Mezco Toyz has been killing it for the last few years especially with their Marvel and DC Comic themed figures, but now (just in time for the release of the new HALLOWEEN movie) Mezco is jumping right on into the realm of horror with their One:12 line of figures as well. Mezco is no stranger to horror, but it is nice to see the One:12 line get in on the action as well. They could not have picked a better character either. The Shape. Pure Evil. Michael Myers. He is easily one of the most popular horror characters in history and they surely did not disappoint us with this figure. "I didn't KILL my wife!" The Predator is the latest installment in the Predator movie franchise that premiered a few weeks ago. 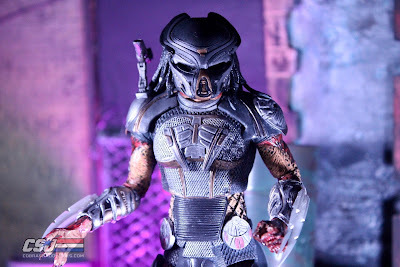 Tons of varied opinions have come from the movie but after seeing it myself the Fugitive Predator ended up looking great on screen and was probably the highlight of the movie. NECA Toys got a first hand look while in development and recently released their figure version of the Fugitive. What is the one thing that Mezco fans can't get enough of? PUNISHER!!! 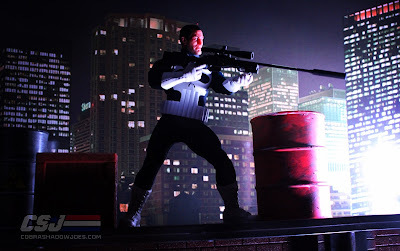 Every Punisher from the original release to the PX to the Classic have been amazing. The SDCC Special Ops edition does not disappoint. He has an uncanny load out only to be matched by the PX edition, but the Special Ops introduces many new goodies to us. The Batman Beyond series ran about 20 years ago, and it was really never my favorite version of him. That being said, Mezco does an excellent job of translating the character into figure form. 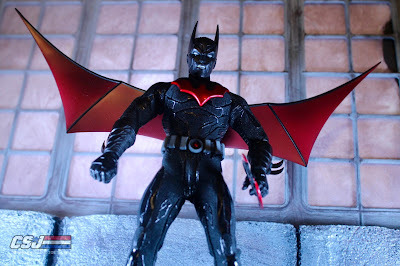 The storyline revolves around Terry McGinnis taking over the role of Batman with an older Bruce Wayne serving as a mentor to him. I found this to be an interesting character for Mezco to produce, but the look and feel turned out great. 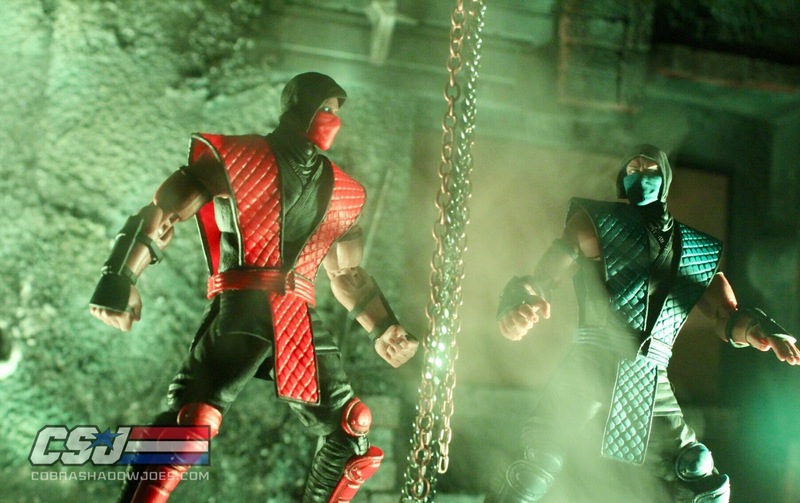 Take a look at our gallery of the expending Mortal Kombat line by Storm Collectibles. Here is a look at some of the most interesting and exciting news about toys, movies, and pop culture from this past week. The Joker is not only the Batman's greatest foe, but he is one of my favorite villains in the DC Comics universe. This crazy psycho is packed with tons of goodies and accessories and truly deserves the title of "Deluxe Edition." This figure is a ton of fun and comes with so much that it's easy to cause a lot of mayhem with him! Here is a look at some of the most interesting news about toys, movies, and pop culture from this past week. NECA has recently released all 4 1990 TMNT Movie turtles in 1/4 scale, and they look fantastic! A nice added addition to the four TMNT is the NECA Baby Turtles accessory pack they just recently released. The pack has all four Baby Turtles along with some other nice accessories for your 1/4 scale Turtles. 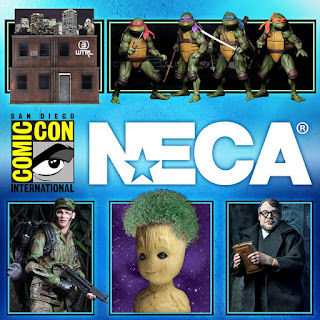 Recently NECA has been hinting and teasing us about a TMNT reveal as one of their SDCC exclusive items. Well, today Director of Product Development for NECA, Randy Falk, revealed them to the world in all of their glory. This year we are being treated to a two for one special. 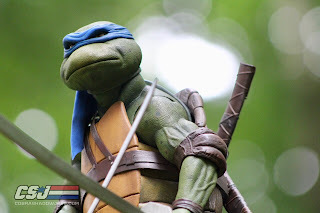 They are new 6" movie style TMNT turtle figures as well as a TMNT diorama set piece. NECA describes the diorama as "over 2 feet wide, over 18 inches tall, and over a foot deep, it’s massive enough to display more than 30 figures at once." We are starting a new feature here every Friday where we will share some of the most interesting topics and news of the week. This week we cover some toys, movie, and video game news. 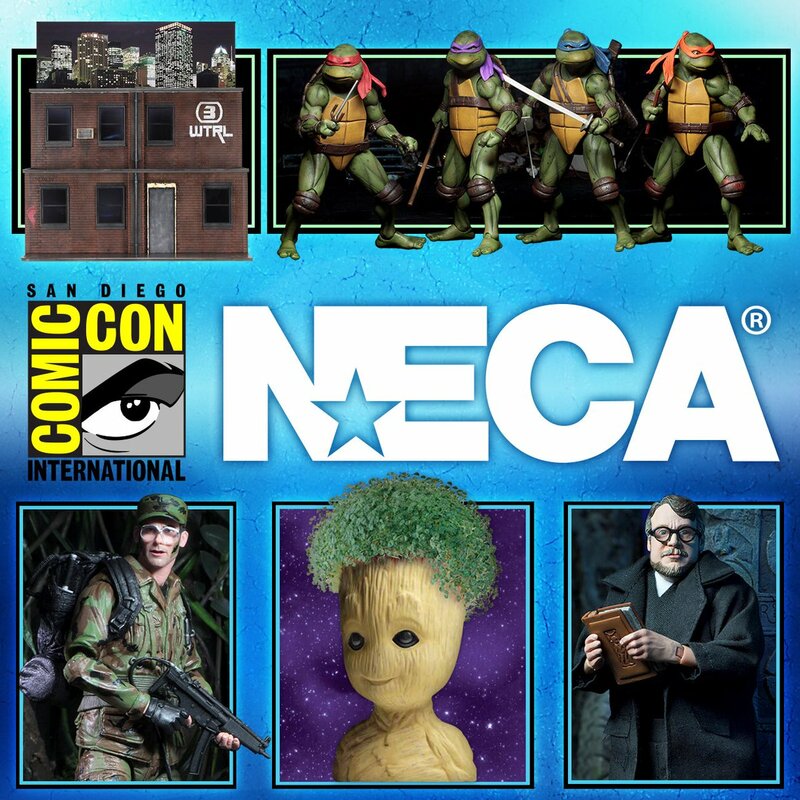 We are very excited about NECA's new TMNT information! We are starting a new feature here every Friday where we will share some of the most interesting topics and news of the week. Topics will run the gamut, and they will cover anything from toys, to movies and entertainment, or anything that tickles our nostalgia bone. Mezco decided to celebrate Batman day with this all black with gold belt Ascending Knight Variant! The Ascending Knight brings with it a very distinct look as Batman evolves over time. This version has a very similar look to the exclusive Batman that was given out by Mezco at NY Toyfair. The Ascending Knight has quickly become a cool little collection I have, and in the end I plan to have all four versions Mezco is making. Let's get into the details with this third installment of the Ascending Knight Batman. Batman is a very interesting comic character that's been around for a long time. Mezco decided that the Ascending Knight deserved to have all four of his looks brought to toy form! This first version is during the time when Batman is developing his suit and techniques to fight crime. The Ascending Knight brings with it a very distinct look as Batman evolves over time. Time will tell which of the Ascending Knights that Mezco makes will be the top, but for now lets take a closer look at the mysterious bat in the grey suit. While I am a huge Wolverine fan the Old Man Logan storyline is not my favorite. If you're not familiar it takes place in an alternate reality in a dystopian future where descendants of the Incredible Hulk and She-Hulk (called the Hulk Gang) viciously run a territory of the country (now run by super villains) called Hulkland. Long story short Logan's family is killed and he takes revenge by killing them all except for a baby named Bruce Jr. A lot happens, but you get the point. While I don't love this particular storyline I do love this this figure. Let's take a look. Batman v Superman: Dawn of Justice is a highly controversial movie with DC fans, and you either love it or you hate it. Despite how you feel about Zack Snyder or how the movie was you can not deny that this figure is amazing. It is based on a couple minutes in the film where we see a dystopian future/alternate reality where everything you know about these characters is turned upside-down. It is an earth where Superman is evil and doesn't hesitate to kill and Batman is a resistance fighter who doesn't have any problem with picking up a gun to get the job done. Mezco had originally shown a prototype of this figure but later announced that they were cancelling the project. 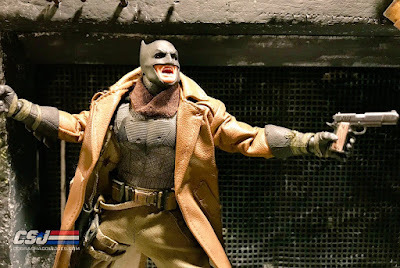 Luckily, an outcry from Mezco fans in support of this figure erupted, and Mezco listened and made this figure a reality. Peter Parker, the little orphan boy who was bit by a spider and gained his powers, is no longer a little skinny boy. He is now seeking out his true meaning. He is now realizing what his true calling is. Shortly after being bitten, he tested his skills against the wrestler Crusher Hogan and defeats him in crazy Spider-Man fashion. After the match, his caretaker Uncle Ben is murdered putting Peter into a frenzy to fight crime his own way. Peter was ready to face the criminals but didn't realize all the real enemies he would soon match up against. If you follow us you probably already know my all time favorite character is Frank Castle. I am pretty active on Instagram, and I have been following Drone Customs out of the UK. He started out casting heads for Batman and has quickly grown into other areas for custom pieces. His main focus at the moment is Mezco head sculpts, and I couldn't pass on his version of Frank's Mask! OK...so I really like this Batman. Mezco's Toy Fair Exclusive Ascending Knight is already a hit with anyone that loves Mezco and Batman. There has been a lot of talk around the variances with this version and if it will end up being the best one of the Ascending Knights. I, personally, think it will be close as Mezco is coming out with some really strong suits in this category. Let's take a closer look at Mezco's New York Toy Fair Exclusive Batman. For the fourth year in a row we had the pleasure of touring the NECA Toys booth at NY Toy Fair. This year Summer Mullins, Public Relations and Marketing Director, was kind enough to take time out of her busy day to show us around and talk about their upcoming products with us. This past weekend we had the pleasure of attending the media event for Mezco Toyz at New York Toy Fair 2018. They had all kinds of new surprises in store for us. The One:12 line has easily become one of our personal favorite lines to collect. 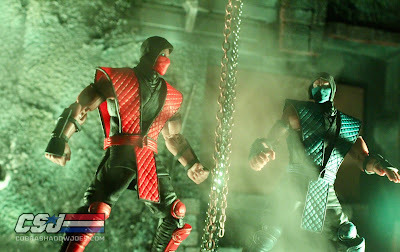 These are super high quality 1:12 scale action figures with cloth goods and tons of accessories. Essentially they remind us of mini Hot Toys, maybe even better. Fresh on the heels of the NYCC Exclusive Tiger Stripe Wolverine comes the standard brown version which is based on the 80's comic book art of him which made its first appearance in the UNCANNY X-MEN. As you know from my last Wolverine review he is by far my favorite super hero. I am happy to get another chance to get him in hand to play with, pose, and photograph. Let's take a look! Deathstroke the assassin has been around since 1980, and a lot of people describe him as DC's version of Marvel's Deadpool. Over time, Deathstroke has taken on the Teen Titans, Batman and Green Arrow with his story always evolving. Deathstroke was originally introduced as the Terminator, taking contracts and eliminating targets. He was chosen for a secret military experiment that gave him enhanced abilities he would later put to use. Deathstroke has the strength of ten men, and also has the ability to use up to 90% of his brain power. Considering these two things alone, Deathstroke has a strong advantage against you. Let's take a closer look at this superhuman Terminator and see how well Mezco did. I will start this off by saying I really wasn't a fan of the Suicide Squad movie and how the characters were portrayed. Harley Quinn was probably the most amusing and interesting character in the movie although I thought her costume/look was off from the comics. Harley is one character that can pretty much wear any outfit and still be considered Harley in the DC Universe, and Mezco does a good job of translating that into figure form. Mezco packs a lot of detail into their first female figure. Let's take a closer look.